Happy Holidays! 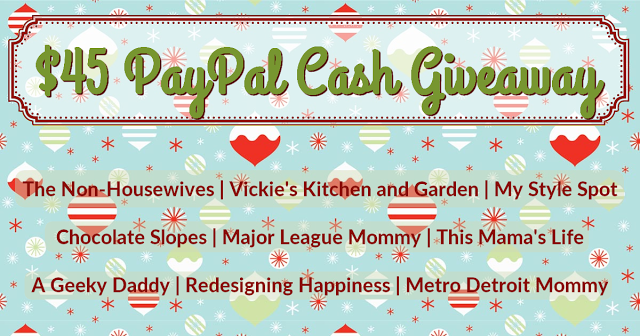 I know everyone can use a little extra cash in their pocket to spend this time of year, so I've teamed up with some of my favorite fellow Michigan-based bloggers to give you the chance to win some PayPal Cash. Complete the rafflecopter entries below by following each blogger on Twitter and one lucky person will receive $45 in PayPal Cash to help with holiday season expenses or whatever else you may want to spend it on. The giveaway ends on 12/4/2016 at 11:59 pm and is open to US residents, ages 18 and older with a valid Twitter Account. Metro Detroit Mommy will be notifying the winner and awarding the prize. Good luck everyone!